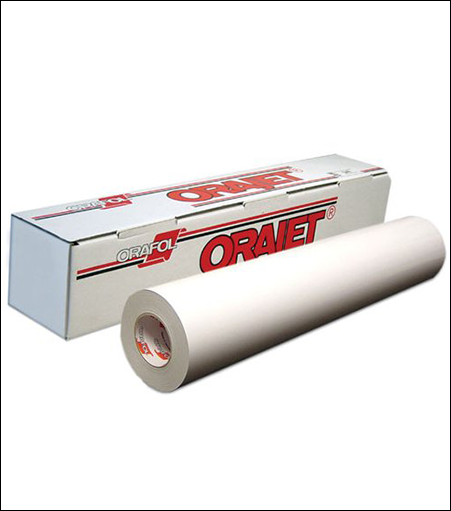 Orafol / Oracal Orajet® 970RA Premium Wrapping Cast WITH Rapid Air® Technology. Oracal® Series 970RA Wrapping Cast with RapidAir air® releaseh technology offers a fast and reliable way to fully wrap vehicles in solid, opaque colors while also providing air release channels to make application easier by reducing incidence of bubbles and creases. This durable film is ideal for long-term fleet and motorsport marketing applications, and provides a lightweight, economical alternative to paint. Featuring a solvent-based, repositionable adhesive and an 84-lb. silicone-coated liner, Series 970RA® film provides exceptional dimensional stability and conformability over curved surfaces, rivets and corrugations. It offers long-term removability from painted surfaces and does not require an overlaminate.